RENT A TRAILER AND 100% OF THE PROCEED GO TO ASSIST VETERANS WITH PTSD! 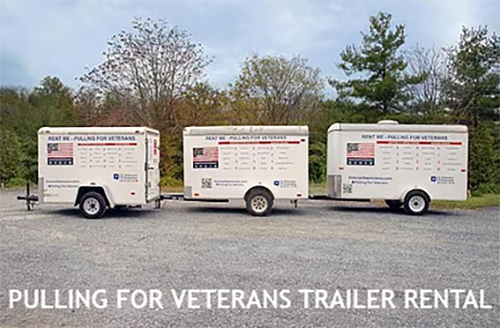 Pulling for Veterans also offers a unique opportunity to not only provide assistance to deserving veterans, but also honor the memory of your solider with a trailer featuring his or her name and photo as a rolling memorial. The 4x8 cargo trailer is lightweight and easy to tow behind any vehicle, it is the smallest enclosed cargo trailer rental. With a loading capacity of up to 1,600 lbs, our 4x8 cargo trailer rentals are perfect for short or long-distance moves as they provide security in transit and protect your belongings from wind and rain. The 5' X 10' cargo trailers are our most popular trailers for rent. All cargo trailers come equipped with a fully enclosed covered hard top and lockable door to securely protect your belongings. The 6x12 cargo trailers are one of the most popular cargo trailer rentals and are used for a multitude of reasons. They are perfect for businesses and transport equipment or goods, as well as individuals who are moving their household belongings. The 6x12 enclosed trailer is built to secure and protect your precious cargo.